In this article, we are going to teach you how to run your first Servlet program. 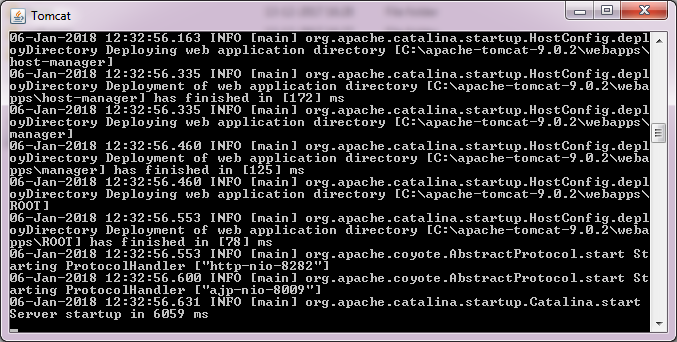 Before we execute a Servlet program, we need to make sure that our Tomcat web server is up and running. Let's see how to do that. We are going to start Tomcat. For this, you need to open the Command Prompt and go to the bin directory of the Tomcat folder present in the C: Drive, such as C:\apache-tomcat-9.0.2\bin and now you type startup(a command which starts the Tomcat Server) and press Enter. 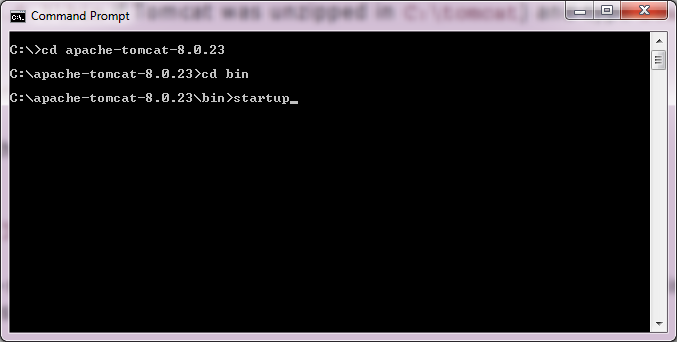 Pressing the Enter after startup command starts the Tomcat web server as shown below. That's it! 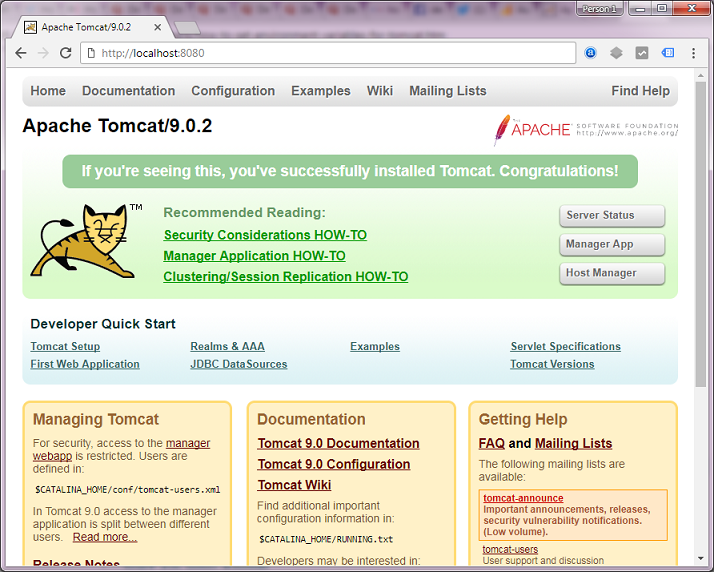 Tomcat web server is up and running and we don't have to close the server window till the time we are working on Tomcat. Just to make sure that Tomcat web server is running is to open your web browser and enter the URL - http://localhost:8080/, which opens the window with a congratulatory message for successful installation and execution of Tomcat. Now as our Tomcat web server is running, let's create a Servlet class. A Servlet class is just a regular Java class which ends with a .java extension, hence we have named this file MyServlet1.java. Project Folder - This folder could be a root folder already present within the Tomcat webapps folder or it could be a folder created by you containing Servlet class(.java) file. WEB-INF - This folder should contain the deployment descriptor file(web.xml) of your Java Servlet program. classes - This folder should contain the compiled(.class) form of your Java Servlet class. Where to save the Servlet(.java) file? 2) Or, we could create a new folder(with any name) in the webapps folder of Tomcat and store our Servlet class MyServlet1.java in it. For example, we can create a new folder Serv within the webapps folder of Tomcat and store MyServlet1.java within it. <servlet-name> tag is used to specify a unique name for our Servlet class, we have given it a unique name FirstServlet. <servlet-class> tag is used to specify the full qualified name of the Servlet class and in our example our Servlet class is named MyServlet1. Where to save the (web.xml) file? 1) If you stored your Servlet class file within the root folder then you should store your web.xml in the WEB-INF folder under the same root folder. 2) If you stored your Servlet class file in a newly created project folder under the webapps folder of Tomcat then we should store our web.xml file within WEB-INF folder of this project folder. After setting the classpath, you need to compile the Servlet class by entering the command at the folder where you've stored the Servlet class file. Next, we need to enter the URL of this Servlet in the address bar of our web browser. This URL may look a little different depending on where you store this file. 1) If the Servlet class file is stored in the ROOT folder at location - "C:\apache-tomcat-9.0.2\webapps\ROOT"
The URL to execute this JSP webpage would be http://localhost:8080/MyServlet.jsp, where MyServlet is the specified in the url-pattern tag within web.xml file. Where, MyServlet is the specified in the url-pattern tag within web.xml file. 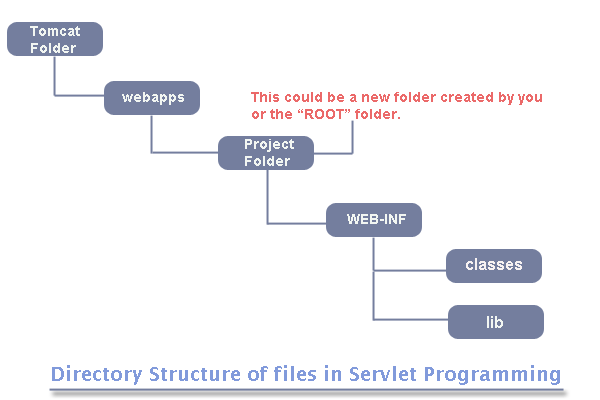 Serv is the name of the folder within webapps folder, in which you've stored the Servlet class.